The Black Girl In Studio. : Subject Line: Tired. The Black Girl In Studio. The black girl in studio with a love for architecture and being diverse all by herself. You should know who I am since I'm the only one here. Sorry for the long hiatus from writing. My goal this semester is to post at least once a week from now on.. Now if only I could get on that treadmill once a week.. I digress. Today's subject is tiredness. Having had weekend classes every weekend, a pin-up this week, one on Friday, and a Mid-Review coming up on Monday, needless to say I'm tired. But it's more than a physical tiredness. A midst all of the usual stresses and problems that make me tired, emotionally I'm just drained. It's difficult looking around and seeing no one who looks like me, who thinks like I do, who even goes through the same things I do. It's taking a toll on my body and mind. And it's more than just being black and a female, sometimes (especially at my school) it feels like I'm the only one not spending daddy's money. Like I'm the only one who WORKS. Then today, a teacher singled me out to say I don't work hard enough. REALLY? One that's false since I have exactly the same, if not more than my peers done on the regular. Being singled out yet again for something obviously not connected to my work really got to me today. Any one else have these feelings? I'm sure I'm not the only one who feels like this. And in actuality I'm not. 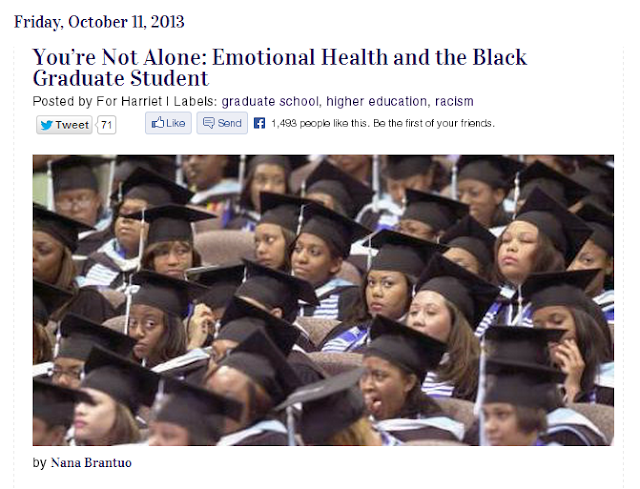 My boyfriend posted this article to my wall that shows mental health is often lacking among black graduate students and especially women. So read this and try to do something to ease your mind this week or weekend. I know I will be. Just a girl with a passion for architecture that helps, blogging about how awkward it really is to be brown.